One of the things I've found that directly influences my choices and inspiration of food is my own history with it. And part of that history includes all manner of comfort foods and guilty pleasures. I'm sure we all have various things we grew up eating or enjoying that we realized were not good for us, and yet from time to time, we crave them. 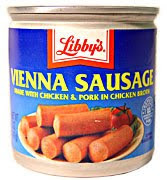 And in my house, that also included the lovely Potted Meat, and typically the Libby's and not the "higher quality" Hormel. I realize too that a lot of it had to do with economics at the time. We grew up on the lower end of middle class, and beyond that, my parents even later in life when things were better still clung to a pretty rigid means of money saving. I remember eating a lot of bologna and hot dogs. And around our way, we didn't get hot dog buns. We would use a knife to score the hot dogs down the middle so they would split open in half, and then we'd put two flattened out between two pieces of bread. I also remember odd things like scrambled eggs with fried bologna. And lets not forget Spam. I remember eating that stuff straight out of the can and also fried. My father was a big fan of frying things, and any time Mom was away, we knew it was either Pizza for dinner or some manner of fried foods including things like Spam, potatoes, and such. But I have lots of good memories of things too. I still almost cough every time I think of eating Nestle's Quik straight from the can with a spoon, and accidentally inhaling a little in the process. I remember the taste of semi-sweet Tollhouse morsels, and how Mom would get mad when she needed them to find that the bag was half empty. :-) And I remember the tart taste of baking cherries right off the tree in the side yard and the taste of the pies later. I also remember the taste of the real original Coca-Cola as it came in the 32oz screw-top glass bottles. My Dad would go through bunches of those, and I was privileged from time to time to enjoy a little bit here and there. Lots of little things like that color my current perspectives on food and flavor both in positive and negative light. But it's neat to look back and see where some of it comes from. What are your fondest food memories as a kid? Mmmm, Underwood Deviled Ham sandwiches on white bread with mayo. I think I'd probably lose it if I tried to eat that now. We didn't eat a whole lot of packaged food growing up since I had both my mom and grandma to cook for us. I also remember, thinking of coffee, that in Germany my friends' mothers would always give us coffee milk and toast with Nutella for breakfast.